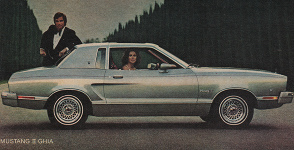 Ghia Luxury/Sport The 1975 Mustang Ghia is a special sport luxury package only for the 2-door coupe body style and includes a half vinyl roof, fog lamps, color keyed body side molding, and luxury interior. 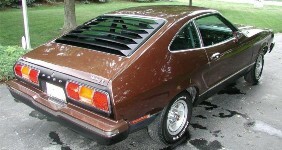 Special Paint Edition Introduced in the mid 1975 model year was the Special Paint Edition Mustang II. 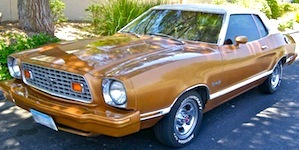 Offering many of the upgrades of the 1976 Stallion Mustang including two-tone paint resulting in wide side stripes, sport wheels, bumper guards, color keyed body-side moldings, color keyed sport mirrors, and interior upgrades. Special Silver Ghia The 1975 Special Silver Ghia Mustang II was a special options package called the Silver Luxury Group added to the Mustang II Ghia. Features of the Silver Luxury Group includes Silver metallic exterior paint, Silver Normande gran half-vinyl roof, unique hood ornament, cranberry tape stripes, and silver bodyside molding outside. Inside there is an all-Cranberry interior in Velour upholstery, color-keyed sun visors and headlining, center console, wood-tone interior trim, and glass moon-roof.